KS and its community partners recently broke ground on the Dr. Agnes Kalanihookaha Cope Community Learning Center. 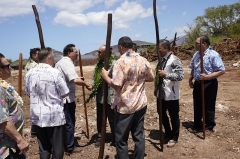 From left to right: Lani Smithson and Tom Broderick (Kiewit Building Group); Lance Wilhem, Jack Wong and Kāʻeo Duarte (KS); Kamaki Kanahele (Kūpuna Council, Nānākuli Hawaiian Homestead Association); Makani Tabura (Kūpuna Council); Representative Stacelynn Eli; Principal Darin Pilialoha and students Braeden Kāʻeo, Donlynn Koyama and Brandy Senas (Nānākuli High and Intermediate School); Kalei Kailihiwa and Kahu Sherman Thompson (KS). KS Trustee Lance Wilhelm greets Kamaki Kanahele of the Kūpuna Council and Nānākuli Hawaiian Homestead Association. 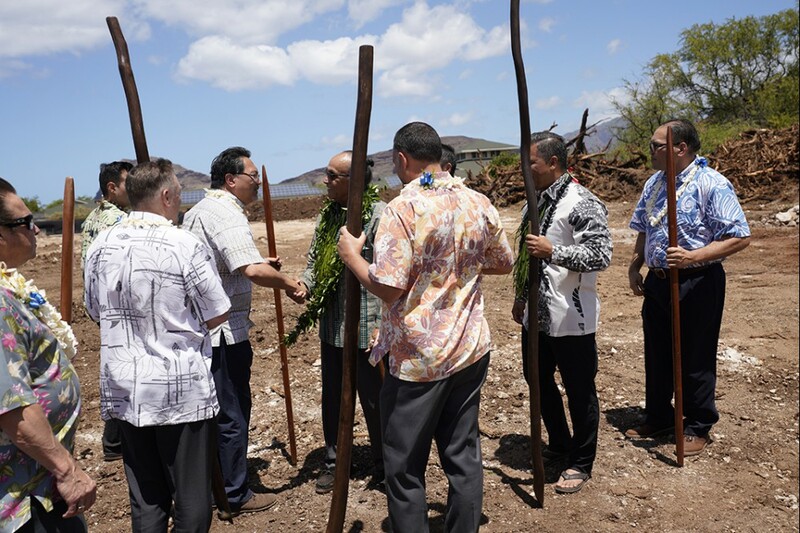 Kamehameha Schools gathered with the Nānākuli community at a formal groundbreaking ceremony this morning to celebrate the start of construction on the Agnes Kalanihookaha Cope Community Learning Center in Nānākuli. The $10.9 million learning center to be designed and constructed by Kiewit Building Group is slated to open to the public by the summer of 2020. The project is named for and honors the professional legacy of Dr. Agnes Kalanihookaha Cope, known fondly by many as “Auntie Aggie,” a longtime Nānākuli resident and champion for Native Hawaiian health, education, culture and the arts. Dr. Cope was a founder of community-owned and -driven Wai‘anae Coast Comprehensive Health Center, and served as board chair for both Papa Ola Lōkahi and Ke Ola Mamo. The Wai‘anae Coast Region is home to the third-largest concentration of Native Hawaiians in the state with upwards of 28,000, including nearly 10,000 in Nānākuli alone. The new center will serve as a place for gathering and learning for community residents and program partners alike. Programs will emphasize Hawaiian culture-based approaches to health, education and ‘āina. The 6,800-square-foot center will include a large multi-purpose room that can divide into three smaller spaces. Covered lānai will allow for hybrid indoor/outdoor gathering areas, and ample space for outdoor learning and community māla (gardens) to be incorporated. The Kalanihookaha Community Learning Center is the second partnership of its kind for KS and the state Department of Hawaiian Home Lands (DHHL) in this moku. In August 2014, KS partnered with DHHL to develop the Community Learning Center at Mā‘ili. 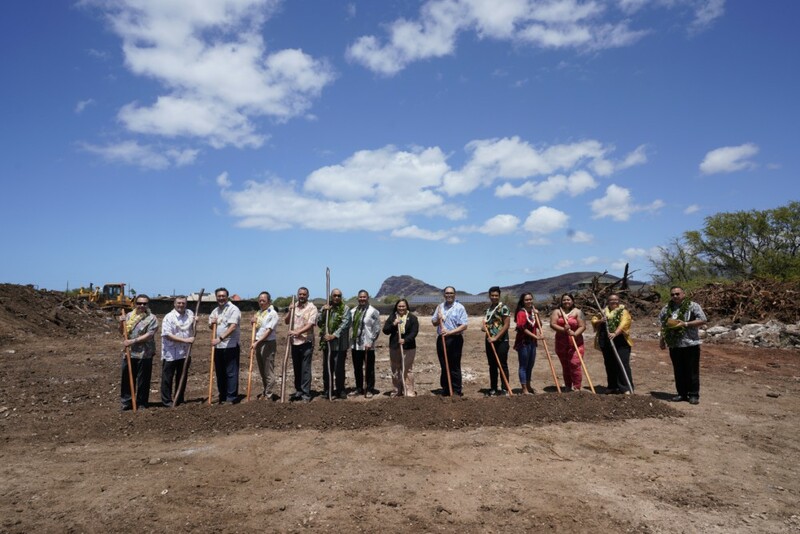 The two organizations have fully executed the ground lease for the land under Kalanihookaha Community Learning Center. For more information visit https://www.ksbe.edu/waianae_coast/kclc/ or email kclcinfo@ksbe.edu.